This iron drain in the sidewalk on Harrison St. dates in the narrow range 1891-1896. Byrne & Murphy, Plumbers, had offices at 1066 Madison Ave., New York City, during these years. The partners were Thomas Francis Byrne (1861-1911) and John S. Murphy (1860-bet.1920 & 1930). Thomas Byrne was described as follows in the Biographical Directory of the State of New York, 1900, Published by Biographical Directory Company (incorporated) New York City, Park Row Building, 1900, page 59, "Byrne, Thomas F. - Engineer and Contractor, 890 Park avenue, New York City; residence 9 East 87th street. Born in New York City, Oct. 29, 1861. Educated at Public School No. 12, and at School of Mines of Columbia University (' 83). (Married.) 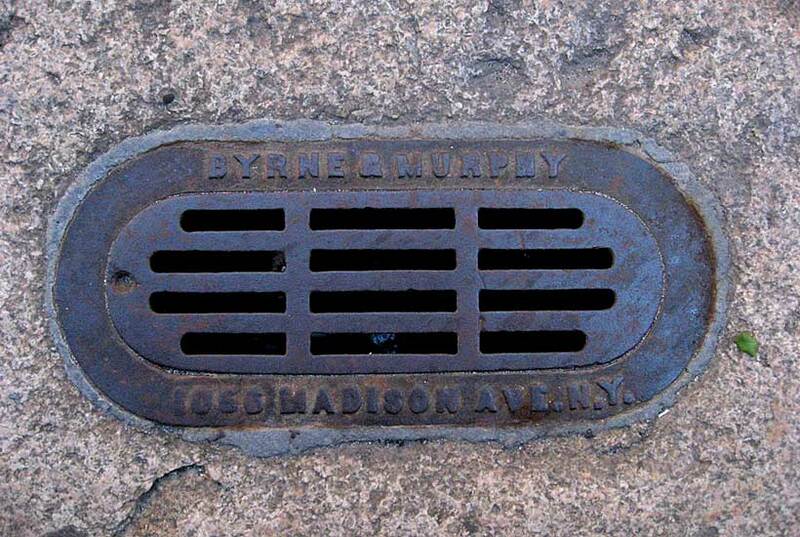 Member of the firm of Byrne & Murphy, plumbing contractors and sanitary and hydraulic engineers. Member Twilight, Catholic, New York Athletic, Building Trades and Hardware Clubs, General Society of Mechanics and Tradesmen, and Tammany Society." Thomas Byrne's obituary in the journal Domestic Engineering, Vol. LVII, No. 4, 1911, page 106, read as follows, "Thomas Francis Byrne, senior member of the plumbing and engineering firm of Byrne & Murphy, died on October 2d at his home, 105 East 79th St., New York City. He death was due to nephritis, after a month's illness. Mr. Byrne was born in New York 45 years ago, and was educated in the public schools and the School of Mines of Columbia University, intending to become a mining engineer. Soon after his graduation he became interested in building work, and finally decided to continue in that line. The firm of Byrne & Murphy is one of the best known in the city and for many years has had practically its choice of work in the important buildings, having made installations in the subway, the Ritz-Carlton hotel and the Singer building. Mr. Byrne was the author of several books which are considered standard authorities in building and construction work. He was a member of the Building Trades Employers' Association and several other clubs and societies. He leaves a wife and two sons." I have not found a similar obituary for Byrne's partner, John S. Murphy. He appears, however, in the U. S. Census of 1900, where he was reported as 39 years old, born New York, August, 1860. He lived at 16 East 130th St. in Manhattan, and his family consisted of his wife, Clothilde, and four children, Edwin, 6, Helen, 4, Claire, 1, and John S. Jr., age one month. In the 1910 census Murphy still lived at 16 East 130th St. and the family was the same with the addition of Adrian M., age 5. In 1920 John S. Murphy lived at 25 Hamilton Terrace, Manhattan. His son, Edwin S. Murphy, was a lawyer. In 1930 Clothide Murphy, a widow, headed the family, who now lived in Pelham, Westchester County, N. Y. On Byrne's death in 1911, John S. Murphy continued on his own as J. S. Murphy & Co. at 353 E. 78th St. Murphy seems to have died in the early 1920s. His last listing in New York city directories was Polk, 1922-23. This ad for Byrne & Murphy from the Year Book of the Architectural League of New York, 1893, is available as a google book. Byrne & Murphy's work on the Presbyterian Building (1894-1895) at 5th Ave. & 20th St. is described in detail at Chestofbooks.com. Byrne & Murphy plumbing at Euclid Hall located at 2345 Broadway between 85th and 86th Sts. is cited in The Metal Worker, 23 Feb. 1901, Vol. 55, no. 8, p. 50.
nycsubway.org cites Byrne & Murphy as supplying the plumbing at the 86th Street subway station on the IRT (Broadway) line (ca.1904).